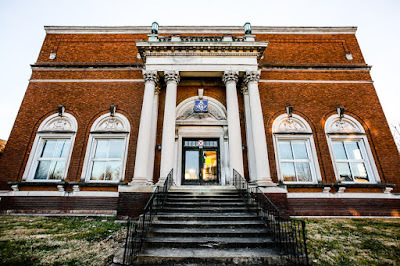 Not one, but two irreplaceable Masonic buildings came across the wires today: the Zembo Shrine Center in Harrisburg, Pennsylvania, and the former home of two of a Jeffersonville, Indiana Masonic lodge. A few weeks ago, the Lemoyne-based Bill Gladstone Group listed the 62,621-square-foot building for sale for $950,000. The building, at N. 3rd and Division streets, long has been home to the Shriners, the Harrisburg affiliate of the international fraternity that follows Masonic principles. In addition to serving as meeting space for the society, the building may be best known throughout central PA for hosting the annual Zembo Shrine circus, in addition to many other large-scale events. Govora said that aging and declining membership, as well as increasing costs for such expenses as property taxes and utilities, are forcing the sale. Moreover, the Shriners want to make certain that they’re able to continue with their principal mission—raising money for 22 children’s hospitals. The local organization currently has about 2,200 members, he said, down from about 10,000 four decades ago. Built in 1928-29, Zembo was designed in the Moorish Revival style, with flourishes of Art Deco, by noted local architect Charles Howard Lloyd. 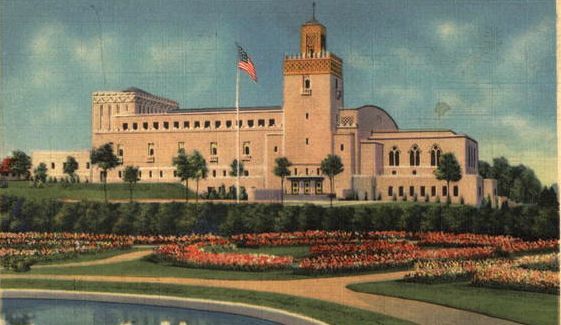 The Shriners selected Lloyd’s design following a heated competition involving some of Harrisburg’s best-known architects, according to “Building Harrisburg,” Ken Frew’s history of the city’s architecture. Zembo cost about $1 million to build. 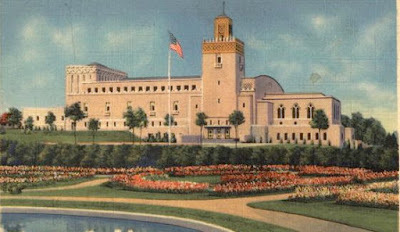 Both Govora and Gladstone said that it may take awhile to sell the cavernous stone-and-masonry building, given its unique design and features, which include rooms full of dazzling, imported tiles, a large auditorium, a 120-foot minaret and 300 parking spaces. Morrison said he expects another institutional user would be most interested in the property. As for the Shriners, Govora said that sale of the property will help them survive as a group and continue their mission. They may ask the buyer to lease back meeting space to them or they might find another, smaller location in the Harrisburg area. “There’s no need for people to get too nervous because we’re not going anywhere as a fraternity,” he said. The project was started just six months before the stock market Crash in 1929 that led off the depression, and it was nonetheless completed by May 1930. Despite the current valuation of the facility at more than $7 million, it's being fire-saled on the market for just under a million, about what it cost to build almost 90 years ago. 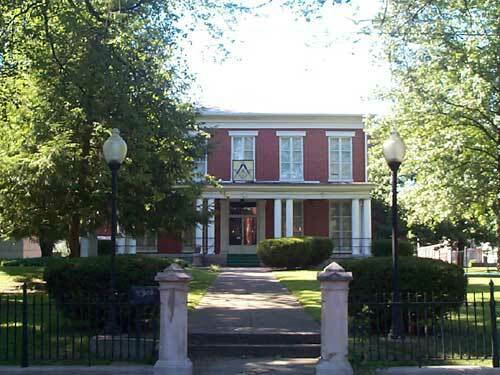 Second is a former Masonic temple in Jeffersonville, Indiana, the onetime home to Clark Lodge 40 and built in 1926. While Zembo is certainly savable and has potential to be a magnificent home for another owner, Jeffersonville's building is not so lucky. The lodge moved out back in 1994, and despite new ownership, it has been largely neglected almost ever since (although a satellite dish on a side roof implies it's had a more recent resident). The clock may be ticking on the fate of one of Jeffersonville's most historically significant buildings — the Masonic Lodge at 509 E. Spring St.
On Wednesday, the owner — Chris Nolan of Pinnacle Properties Development Group — filed an application with the Jeffersonville Building Commissioner’s Office to raze the deteriorating building. It must be posted for two weeks, which started Wednesday. 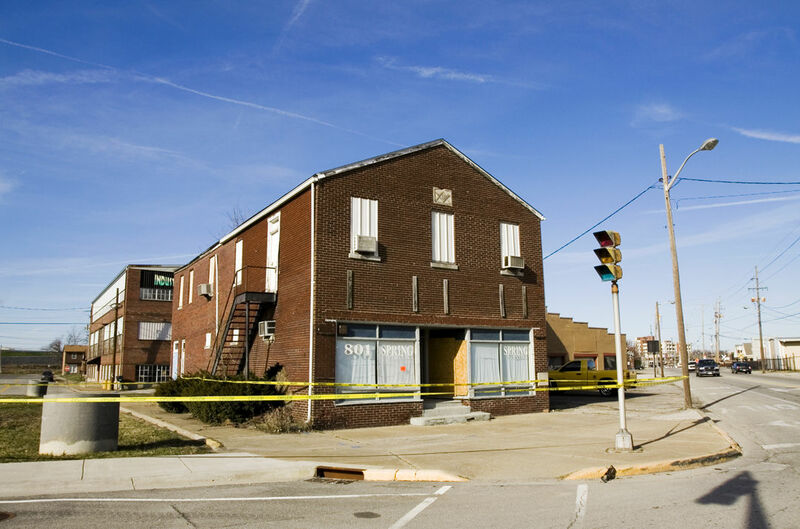 Thirty days is the soonest any demolition could occur but first, Nolan would need to secure a Certificate of Appropriateness from the Jeffersonville Historic Preservation Commission, due to the building's historical importance. The commission meets the second Monday of each month — the next meting is Feb. 13 and Nolan must apply for the certificate and be placed on the agenda before action can be taken that night. A structural engineering investigation, performed by Renaissance Design Build, Inc., accompanied the application to the building inspector. The report states that through a “non-destructive visual inspection,” engineers noted deterioration throughout the building — sections of roof missing and pieces of roof scattered around the site, standing water on all three floors and the basement, including a foot of water in the boiler room, electrical panels, metal box gutters and electric service which had fallen from the building, more than 50 percent of plaster walls and ceilings that were missing or damaged and ceiling and floor assembly failures throughout the structure. But Greg Sekula, director of the Southern Regional office of Indiana Landmarks, a statewide nonprofit preservation organization, hopes things turn around. “Jeffersonville has lost a tremendous amount of historic buildings over the years from everything to interstate construction to flood to fire and this is one of the true landmark properties that remain — we need to do everything we can to save this building,” he said. The three-story, 20,000-square-foot building, which overlooks Jeffersonville's Warder Park, was built in 1926 and was in use by the Masons until 1994. It was added to Indiana Landmark's top 10 list of endangered buildings statewide. It is also a contributing structure to the Old Jeffersonville National Register Historic District. 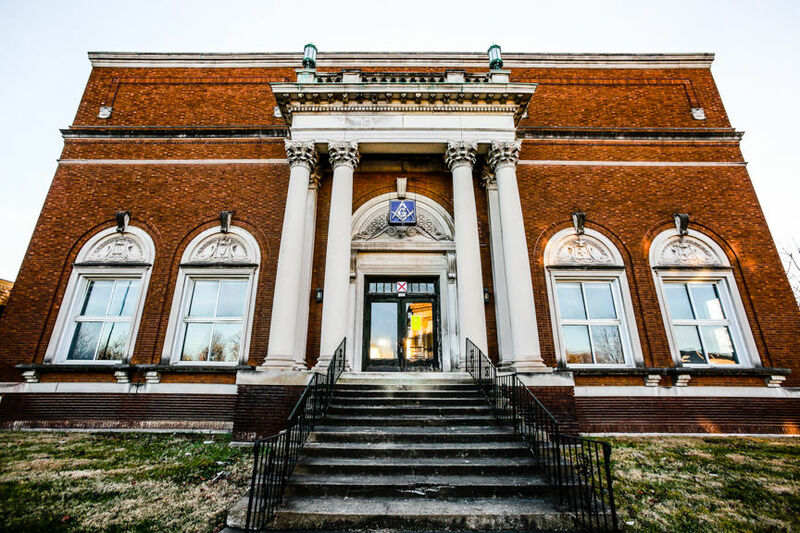 “Without a doubt, this is probably the most significant historic building in Jeffersonville remaining in terms of grand civic structures that have not been rehabilitated,” he said. Sekula said that he and others at Indiana Landmarks have been in contact with Nolan over the years — alerting him about avenues of preservation that were open to him. Sekula said he let Nolan know about the state and federal tax credits that were available, and offered the possibility of donating or selling the building for rehabilitation. Nolan could not be reached for comment by press time. According to a Jeffersonville ordinance regarding historic preservation, the commission must consider certain criteria when determining whether or not to accept the application, including the state of deterioration and affect the demolition would have on the historic district. If it is denied, the building may still be demolished if the owner can prove they have exhausted all possibilities to try to preserve or sell the building. “We would hope that we could work with Mr. Nolan to come up with an alternative to demolition,” Sekula said. The town has been a mixed bag architecturally for historic Masonic buildings. Also in Jeffersonville, the historic longtime home of North Star Lodge 3 of the MW Prince Hall Grand Lodge of Indiana at 801 Spring Street (right) got the wrecking ball in 2015. The lodge reportedly was going to move to nearby Claysburg, but I can't find any record of it since 2015. If anybody knows its fate, pass it along and i'll update. Jeffersonville sits directly across the Ohio River from Louisville, Kentucky, and was an important stop westward in the early days of Indiana because of a geographical speed bump in the river known as the "Falls of the Ohio." The obstruction to river traffic there exists even today, and a substantial lock system was constructed on the Kentucky side. During the Westward Expansion, no matter what you were paddling, you had to get around the Falls or just leave the river entirely. So, Jeffersonville was extremely important. There was already a Masonic lodge in the town just a year after the formation of the Grand Lodge of Indiana in 1818: Posey Lodge 8 (chartered 1819, but surrendered in 1833), and was replaced in 1835 by Clark Lodge 40. 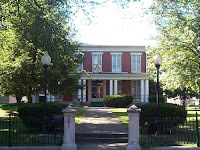 After moving out of the 509 Spring Street building in the 90s, their newer home is now at 303 E. Park Place, and they share it with Jeffersonville Lodge 340. Still, there's a preserved Temple left downtown. The beautiful current home of two more Jeffersonville lodges of the GL of Indiana F&AM is at 805 E. Market Street (also facing Spring Street): New Albany 39 and Pythagoras 355. Their beautiful Italianate home was originally built as a private residence, the John Connor house, in the 1800s (photo at right), but the lodge has been there since at least 1900. Sad to see the loss of this buildings. With the decrease in the membership through the Fraternity and the appendant bodies, we have to make these painful decisions and sell off our buildings. What has long been needed is a clearing house offering ideas for saving our buildings, a resource of funding ideas, sympathetic developers, tax experts. In some cases after a fire sale, the former lodge is turned into a money spinner by the new owner. I must make a couple of corrections. First, the lodges and chapters left the Spring St building in late 1995, not 1994. Also, those last two lodges are in a separate city called New Albany, 10 miles away.